Hot Chocolate Powdered Drink with Sugars and Sweetener. Just add water. 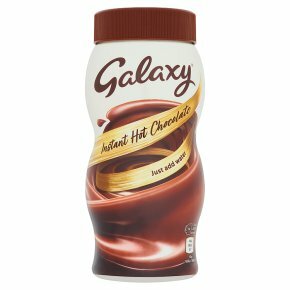 Made with Galaxy® chocolate. Suitable for vegetarians. x4 (25g) We recommend you use 4 heaped teaspoons per mug, pour hot water over the hot chocolate powder. Stir well and enjoy the silky smoothness.